Thousands gathered in Manhattan to hear Democratic presidential candidate Bernie Sanders speak, five days before New Yorkers cast their votes. "When I look at an unbelievable crowd like this I believe we're going to win here in New York," the Vermont senator said in Washington Square. Organisers say a crowd of 27,000 heard his key themes of income inequality and Wall Street greed at Wednesday's event. His rival Hillary Clinton attacked the Republicans at an event in the Bronx. She remains ahead of Mr Sanders in the state-by-state race but New York has many delegates up for grabs. Delegates are awarded by each state according to the vote given to each candidate. They are party members with the power to vote for that candidate at the party conventions held in July. Is Wall Street a problem for Hillary Clinton? Are Trump and Sanders right about trade? Both Mrs Clinton, the former secretary of state and first lady, and Mr Sanders have strong New York ties that they will be sure to underline on Thursday night when they meet in a televised debate. It comes as Mr Sanders was forced to distance himself on Thursday morning from offensive comments made by a speaker at his rally that appeared to be directed at Mrs Clinton. Health care activist Dr Paul Song apologised after referring to "corporate Democratic whores" - language Mr Sanders said was inappropriate and insensitive. 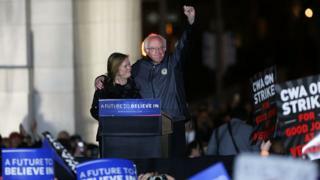 Mr Sanders said the rally in Washington Square, with its famous arch, was the most important event yet of his campaign, which for months has drawn huge crowds across the country. "It is about creating a political revolution," he said to those gathered. "It is about creating a government which works for all of us, not just wealthy campaign contributors." He spoke about growing up in Brooklyn as the son of immigrants and he referred to New York landmarks like the Stonewall Inn in Greenwich Village, the birthplace of the movement for gay rights. Minority voters will play a key part in New York. Earlier on Wednesday, Mrs Clinton said the country's long struggle with racism had a long way to go, as she appeared on stage with civil rights activist Reverend Al Sharpton. She attracted an enthusiastic crowd of 1,300 people to a Bronx community centre, where she did not mention Mr Sanders but turned her fire on Republicans Donald Trump and Ted Cruz, whom she accused of dividing America. "He wants to build walls - I want to build bridges," she said about Mr Trump. The New York businessman leads the three-man Republican field but may not get enough delegates to win the nomination outright. He has accused the Republican party of stacking the rules against him - a charge party leaders have dismissed as ridiculous.